Since it’s probably not, er, kosher for people who are looking at testicles to think about the estrous cycle at the same time, we’ll need to include RelEd. They’ll need to figure out which roofs can support the bathing facilities for menstruating women or deal with the resulting ritual uncleanness. And the sheep—oh my! Students who merely hear the sheep being jugulated, as well as those who are fortunate enough to be splashed with warm blood and then followed by hordes of flies, will be soooo grateful for the advent of Christ that Christmas will hereafter have a much deeper meaning. Of course, a tabernacle camp is not our first experience with this sort of thing. We dedicated several decades to live-action role playing of OT polygamy, and since then we moved on to Trek. But I can see opportunity here for a potent combination: Let’s put the Ark in a handcart, hook up a lactating cow, and see what happens. Will she head for the barn or the Provo temple? 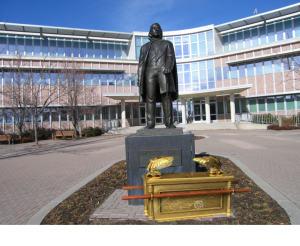 (Note: call the temple president and make sure he knows what’s supposed to happen to mommy cows who do YHWH’s bidding…) On the other hand, we could set the Ark near the statue of Brigham Young and see what happens. If the RelEd profs start hopping through the doors of the Wilkinson Center, we’ll know how it went. Update: And now I have found that the tabernacle model has indeed made it to BYU. Maybe we could broadcast part of General Conference from there? “Live from the Holy of Holies, it’s the Saturday Night Priesthood Session!! !” Could take a while to cast lots to decide which high priest gets to go inside, though, since we have rather more of them these days. Anyway, we can leave off the description from Meridian and turn our attention to the flyer, which may be seen here. The tabernacle display is still described as having an educational purpose, although we’ve apparently lost the experiential facet. Sorry gentlemen, no beards. Speaking of instructional purposes, the flyer is singularly uninformative when it comes to details that might help the reader judge the educational potential. For example, it doesn’t tell us who built the model or who was consulted about it. There is one LDS scholar with the chops for this, he doesn’t teach at BYU, and he’s not mentioned. The picture is taken from a textbook, so there’s no way to judge from the appearance. That said, I must admit that this sort of thing does have potential. It could indeed help students contextualize ancient Israelite cultic practices within the wider ANE, it could teach them about how Christianity and specifically the LDS community have received the indicated biblical texts (reception history), and it could be an opportunity for an inter-faith experience with some of Utah’s Jewish rabbis and their synagogues. I see no indication of any Jewish participation, so I guess an inter-faith experience is out. Students are cautioned to respect “the sacred nature this had for ancient Israelites,” but what about the sensitivities of our Jewish friends and neighbors? Will the needed cultural and religious sensitivity appear without positive guidance? Finally, one hopes that Utah’s rabbis didn’t first hear about this through the Deseret News or KSL and that they’ve accepted VIP tours with appropriate BYU leaders. Also, it will be best if there is no supersessionist rhetoric in the tour guides’ monologues. Another option is to use the tabernacle display for a straight-up presentation of ancient Canaanite shrines, palladiums in the ANE, typical cultic practices and so forth. In Ugaritic myth, El does have a tent-shrine, ancient Phoenicians do seem to have used them as palladiums, and pre-Islamic Arabic tribes also carried them. However, the tent-shrine as described in Exodus is probably far too elaborate to have been carried around the desert, so the guides will explain that the description in Exodus is probably anachronistic or perhaps an idealized literary creation that supported the earliest centralization of Israelite worship under Josiah. And of course, this exposition will be no surprise to anyone at BYU or in the wider LDS community. Finally, it could be approached through reception history. First, there will be an explanation of tent-shrines in the ANE, as above. Then the Christological application made in the New Testament’s Epistle to the Hebrews will be contextualized as part of the early Christian reception of these texts. Finally, one might hear how various LDS authors have used both Exodus and Pseudo-Paul for apologetic and didactic purposes without suggesting the existence of any evidence for a Christian or Mormon understanding of any of this in ancient Israel. Tour guides will need to be both willing and capable of explaining all this to the satisfaction of everyone concerned. So I’m thinking that what we’ve got here is this, that is, the tabernacle replica created by the Huntington Beach Stake for a high school youth camp, now billed as an educational opportunity to be held on the grounds of a major American university. And yet, the organizers don’t seem interested in giving the good folks of Huntington Beach any credit for this, do they? Hm. This event is sponsored by RelEd and the Religious Studies Center. If anyone in either of those two communities would like to clarify the educational objectives of this event against the intellectual standards of a university and draw our attention to how what happens will actually accomplish them, we’ll be happy to publish your thoughts. Otherwise, this would perhaps have been better on the grounds of some Provo stake center. Wow, that was super snarky. But I definitely came away with the impression that you are way smarter than that “YouTube scholar”, so there’s that. We had a rabbi from the community in attendance to answer any questions. He loved the display.